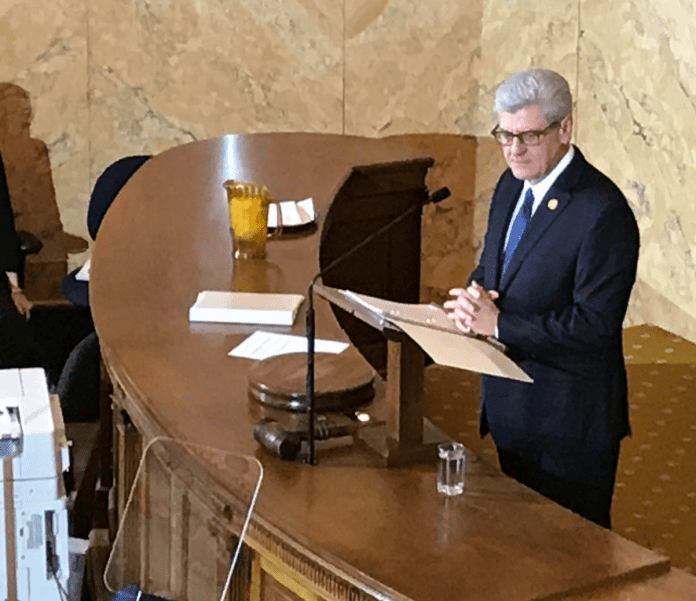 Governor Phil Bryant addressed Senators and Representatives on the floor of the Mississippi House for the last time as Governor of Mississippi. In his speech Bryant touched on several topics. One of which, he called on lawmakers to join him in ensuring that teachers receive their second overall pay raise since 2014. “Our gratitude to these classroom heroes and the essential value of public education are why we passed a $100 million dollar teacher pay raise in 2014 and why I now call on the members of this body to join me in giving teachers their second pay raise in five years. Send me a bill to authorize a pay raise for these most critical guardians of Mississippi’s future, and I will sign it,” said Bryant. He not only urged Legislature to ensure the pay increase for teachers, but passage of the MS Safe School Act. 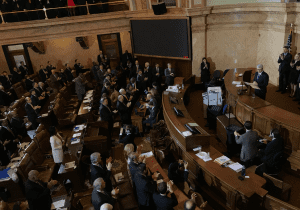 The recommendation comes from a year-long study and Governor Bryant believes if passed it will allow parents, teachers and administrators to care for children in a safe and protected environment. He referred to schools as a place that use to be considered a safe haven, and hopes moving forward to ensure children’s safety will bring them back to that. While the state of Mississippi has been recognized nationally by the President for it’s strides in criminal justice reform, Gov. Bryant says the fight is not over. 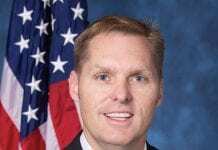 He said it is now time to address the 33% of incarcerated individuals that leave the correctional system only to return to in within three years. In his address the Governor took time to congratulate the state on some areas in which Mississippi is excelling. Since it’s implementation, the 3rdgrade reading gate is working, graduation rates are the highest they’ve ever been in the state, unemployment is at an all time low, the Mississippi Development Authority has created of over 3,500 jobs, and Child Protective Services has been one of the largest success stories with nearly double the adoptions in just one year. In 2012 graduation rates were at a low 75%, today they are at 83% which is the highest percent of high school graduates yearly in Mississippi history. This is in part due to the effectiveness of the 3rdgrade reading gate. “In 2011, only 54% of Mississippi third graders were reading with proficiency. With the implementation of the third grade literacy policy, we have dramatically improved student opportunity and thus the future of our state. In the last testing cycle, 93% of Mississippi’s third graders were reading proficiently,” said Gov. Bryant. Improvements like this in education could be a direct indicator of the states low unemployment rate. It has been at or below 4.8% for 12 months in a row and the median household income has risen by 8.4% since 2011. In his time as Governor, $12 million has been put into primary care in rural and underserviced areas throughout the state though the Rural Physicians Scholarship. This placed 33 practicing physicians in rural Mississippi, and that number is expected to double by 2020. Probably one of the most indicative factors of a successful term is the state’s strong revenue stream. “State revenues are reflective of an economy that is gaining and expanding. Adhering to conservative budgeting principles, we have reserved nearly $350 million in rainy day savings. Revenue collections have already exceeded estimates by $90 million and corporate income tax is out-performing year-to-date estimates by nearly 16%,” said Gov. Bryant. “I started as a young man, and I will finish as a grandfather. Over these many years I have seen Mississippi make incredible progress. It may not have always been perfect, but the march of improvement and advancement in our people’s lives over the last 30 years is undeniable. None of us can accept credit for all of it, but we can all claim the honor of toiling and striving to make our home a better place,” said Bryant.